Marvel Rising has a lot to live up to when it hits a medium that’s a bit more main stream. Its goal of representing the next generation of heroes for younger readers is one I admire completely, but I’ve been pretty disappointed with Marvel’s animated projects lately. This one looks like it’s going to have the same cheap animation and bland art style. But how about the prelude comic? Is it going to phone it in because “it’s for kids, who cares?” Or will it be an intelligent story aimed at kids but enjoyable for all ages? With G. Willow Wilson on board, the one who truly understands Kamala Khan and why people love her, I did have some high hopes for at least her parts of the story. And she does deliver at least in dialogue, but it does sometimes scrape against a plot and set ups for jokes that aren’t quite as mature as Ms. Marvel’s own book has been. These scenes fall flat almost all the time and never got more than an internal “heh” out of me. The comedic parts are mostly just characters reacting to things in quirky ways. Between these moments and a plot that seriously meanders, I think it’s safe to say that this book is way longer than it needs to be. There so much that could be cut. Much of this issue is spent on the group trying different things in order to escape from a game that they’re stuck in. Of course, only one thing works, and the rest doesn’t really have any significance to the plot, at least in this issue. Surely, we could have cut to the chase, or at least condensed it all into a montage, yeah? Marvel Rising is at its best when it’s actually trying to teach its readers something rather than just entertain them. When characters discuss the differences between themselves and the villain, when the book can actually make you think about an idea, that’s when it’s doing these characters justice. And Ms. Marvel’s usually the one that brings up these discussions. Thank you, Ms. Wilson. The art is… fine for the first (Ramon Bachs’s) half of the book. His work excels in conveying character specific attitude’s and reactions at any given moment, which both go a long way in making us feel like we should care (because they care). In the moments between, though, faces can look a little silly when I don’t think they were supposed to, and heroes who shouldn’t can look a little stubby or even a little fat. It’s a bummer for Bachs as well as colorist Rachelle Rosenberg that his only splash page is…. the power being out on a school campus. I mean, there are zombies, but zombies aren’t that visually interesting from a distance. Rosenberg actually gets to flex her muscles in Strachalski’s half of the book, when they’re trapped in the video game and finally confronting the antogonists. Aside from drawing everybody with such cute (and samey) faces, an MMORPG allows for much more engaging scenery and interactions than a school campus at night. There’s two types of people I can recommend this book to: first, young readers. 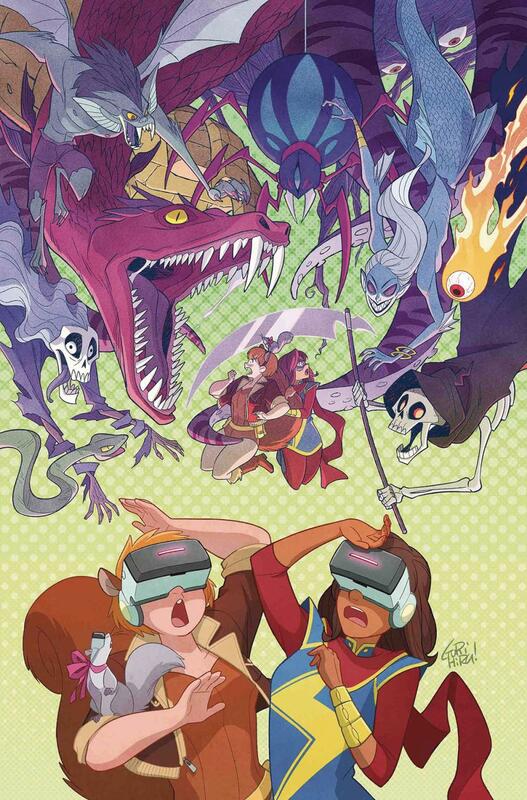 It’s not quite How To Train Your Dragon 2 material, but I think Marvel Rising: Ms. Marvel & Squirrel Girl #1 (Part 3 of this story? Even I’m confused. Is this canon?) will do a good job of introducing this audience to comics and engaging them in the world. The second type is the people who already read comics and enjoy these characters, but maybe skipped the first two parts. Although part one was from Free Comic Book Day… so you could get that and fill in the blanks between issues. The plot kind of moves in circles, but the book represents these characters well enough to satisfy the fans. Not a must but you won’t regret your purchase either? Yeah, get it on sale.